On Saturday in Monte Carlo, Monaco Gennady Golovkin scored his 16th knockout in a row by defeating a very game Osumanu Adama. Golovkin registered three knockdowns in fight as he improved to 29-0, with 26 wins via knockout. A jab sent Adama to the canvas at the end of round one. The right hand that followed was just icing on the cake as Adama was on his way to the canvas. A left hook knocked Adama down in the sixth, forcing an eight count from referee Luis Pabon. Adama went down again from a Golovkin a left jab in the seventh. Golovkin followed with two left hooks, which prompted Pabon to step in and halt the fight. After the fight, Golovkin made it known where his sights were set. ”I want to fight Sergio Martinez to prove who the best middleweight is,” Golovkin said. Golovkin’s promoter said they will make three offers for Golovkin’s next fight. Golovkin’s team already has Madison Square Garden locked up for April 26. Rumor has it that the three offers will be extended to Andy Lee, Daniel Geale, and James Kirkland. While each of those guys offers unique values of excitement, the bottom line is we need to see ‘GGG’ in with Martinez, Peter Quillin, or Felix Sturm. If not, then the move up to fight Andre Ward or (if he wins his next fight) the winner of Chavez Jr and Carl Froch. Gennady Golovkin has passed the eye test each time I’ve watch him fight. I have no doubt in my mind that he’s beyond urban legend status. However, his signature win is against Matthew Macklin at this point. While Matty “The Knife” is a good fighter, he’s come up short each time he’s stepped up; with losses to Sergio Martinez (corner stoppage round 11) and Felix Sturm (split decision). At this point, I’d even take a Sakio Bika or Andre Dirrell to legitimize Golovkin’s superiority. At least he’d pick up another belt for his troubles if he defeated Bika, which by no means is an easy task. The problem with a Quillin fight continues to be the ‘Cold War’ between Golden Boy Promotions (exclusive to Showtime) and the HBO, network where Golovkin mainly fights. Oddly enough, HBO didn’t air the Monte Carlo fight because “the venue could not accommodate our production needs.” I find this hard to believe. HBO asserts that the venue was too small for the equipment to fit into the small facility where the fights took place. My take on this is that Golovkin is being undervalued. Maybe HBO feels that while his fan base is growing, US ratings for an early afternoon Monte Carlo fight might not measure up to HBO standards. I look at numbers from some of his primetime fights and strongly disagree. The bottom line is this: Gennady Golovkin liked the schedule of fights he had for 2013. The goal was to fight five times in 2013 and Gennady fought four. His last fight in 2013 was against Curtis Stevens on November 2. The next available date HBO had for Golovkin was the aforementioned April 26 bout in MSG. If Golovkin waited until that date he would’ve been inactive for close to 6 months, counterproductive to his goal of staying as busy as feasible. So in other words, unless HBO is willing to give more dates to K2 Promotions, we could see the same deal materialize in the future- Golovkin fighting on a small pay-per view (as he did in Monte Carlo in 2013) or on a fight where US fans stay in the dark to watch. I’m not sure he’d fight on an HBO co-feature of a Klitschko fight if he’s ready to go when Wlad is slated to fight. Boxing is still business and once you become main event material, you tend not to want to share top billing with anyone else. It’ll be interesting to see what happens after April. If Gennady Golovkin comes out of his next fight unscathed, will he wait until the next available HBO date? Or will there be some non-HBO fights mixed in between? 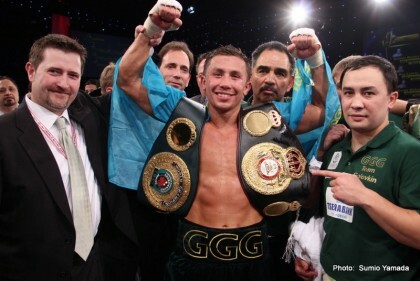 You are here: Home / Boxing News / Gennady Golovkin: Now What?